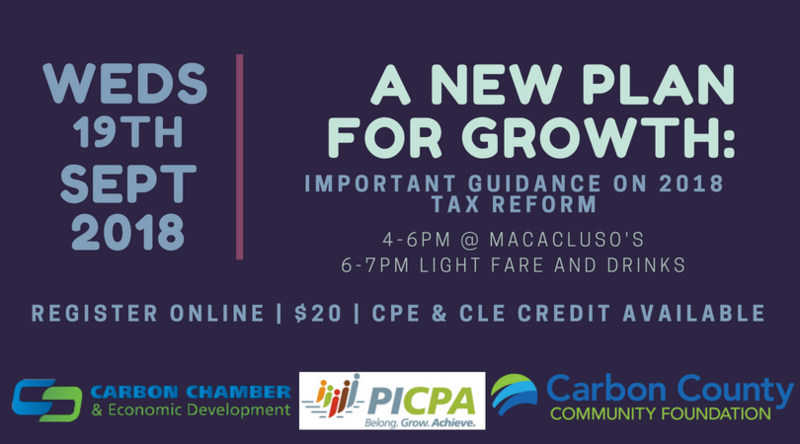 Weds., September 19, 4-7pm @ Macaluso’s, Nesquehoning, PA. Join the PA Institute of Certified Public Accountants Northeastern Chapter, the Carbon County Community Foundation, and the Carbon Chamber & Economic Development for a two-hour presentation on the Tax Cuts and Jobs Act. In addition, leading experts will speak about tax reform and the Work Opportunity Tax Credit. Space is limited – Registration required – 20$ – Includes drinks and light fare. Who should attend: CPAs, Lawyers, Financial Advisors looking to provide up-to-date advice to their clients. Business people looking to take maximum advantage of recent tax reforms.